If you have small children, houseguests, or just a house that’s difficult to navigate, you’ve probably used traditional night lights at some point. They’re bulky, they’re intrusive, and they take up at least one of the sockets on your power outlet. 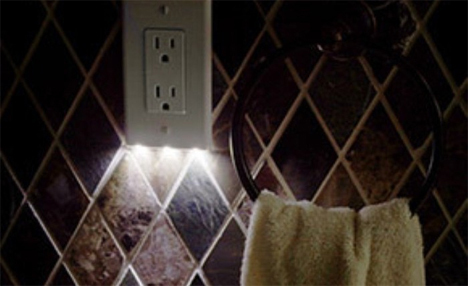 The SnapRays Guidelight from Snap Power is a simple but brilliant alternative that lets you keep both sockets open while illuminating your space. 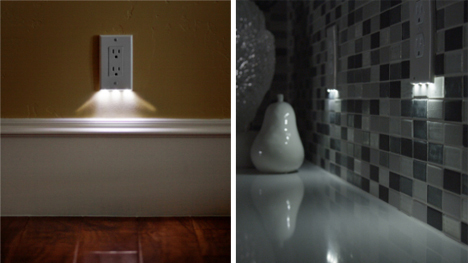 The SnapRays Guidelight takes the place of an ordinary outlet cover and looks just like one except for the LEDs at the bottom. The lights have a sensor so they turn on at night and off in the day. According to the company, the LEDs cost less than 10 cents per year to operate, and they can keep producing light for more than 25 years. Installing the nightlights is easy enough for just about any adult who knows how to use a screwdriver. 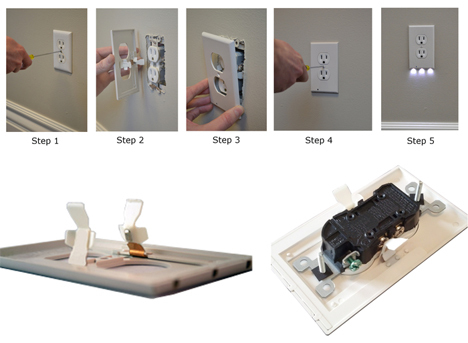 You just have to shut off power to the outlet you want to install the Guidelight on, then unscrew the existing outlet cover plate. The SnapRays Guidelight fits over the outlet, you screw it in place, and it’s ready to go with no wiring or electrical work necessary. It works with two clip-type arms that the company calls “power extractors.” These make contact with the sides of the outlet and provide energy to the sockets as normal. The device also draws a tiny bit of power from the outlet to light the LEDs. 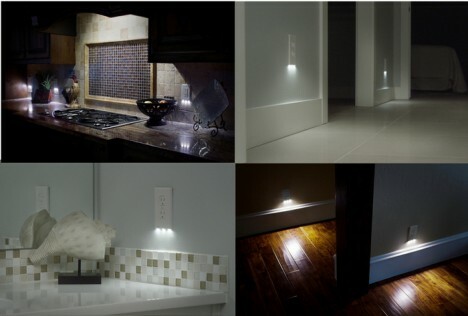 Because the nightlights look just like regular outlets, they don’t take up any extra space – but they do provide a nice ambient light in the dark that helps you get around without hogging your electrical outlets. They’re available from Snap Power’s website. See more in Industrial Design or under Technology. June, 2014.